We are always looking for enthusiastic new EKO Leaders; take a look at our jobs page if you are interested. Natasha founded Educating Kids Outdoors in 2012 with the vision of offering a different learning approach to pupils using the outdoors and natural world to inspire, imagine, experiment, explore, wonder, think and problem solve both as individuals and by working with others. After university Natasha ran school expeditions overseas and went on to develop educational programmes in deprived areas of the UK as well as volunteering with young people in many different capacities. 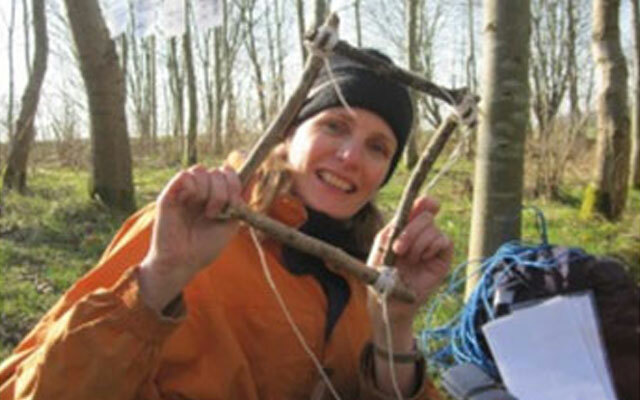 In the past few years she has gained her Forest School Leader Level 3 and Teaching Assistant Level 3 qualifications to enable her to understand current thinking and processes in schools and outdoor learning. She believes passionately that pupils thrive in a supportive environment where they have space to think, opportunities to have a go and time to explore and discover things for themselves. The natural world and its ever changing seasons is the perfect setting to maximise learning opportunities and help children grow into calm, considerate, capable young adults. Rachel is a highly creative, dynamic and energetic teacher with a great sense of fun who has a passion for Outdoor Learning. She qualified with an Environmental Science Degree and P.G.C.E. in Primary Education and has a wealth of experience teaching in a variety of challenging settings, valuing each child as a fantastic, unique individual. She has been teaching in the classroom for nearly 20 years having taught all age ranges from Early Years through to Year 8. In addition she is active in her local community as a Cub Leader. 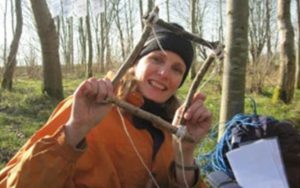 She is a qualified Forest School Leader Level 3 and is excited to share her expertise to develop a programme of learning that addresses the holistic needs of the children in your setting. 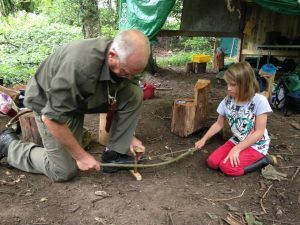 Simon has been in the engineering profession for 25 years but has recently changed his career path to follow his passion for educating children about the wonders of the outdoors and the joy of woodcraft skills. Simon’s love of the great outdoors began at the age of 8 when he joined the scout pack at Knowle, Solihull. That passion continued to grow and Simon now has 30 years leading experience with both the cubs and scouts at the same pack in Knowle. Simon loves the discipline of the scouting movement but equally enjoys leading survival nights and tool activities. Simon is currently in the process of gaining his Level 3 qualification in Forest School Leadership and is running 3 successful EKO groups at 2 local schools. Nikki has been working in Outdoor Learning for over 20 years and believes that learning outdoors has massive benefits for children’s learning, growth and development. After volunteering as a ranger at a Birmingham Country Park she gained a HND in Countryside Management specializing in Environmental Education at Agricultural College. Her employed positions have included Teaching Assistant at a small rural school, 12 years as an instructor at an Outdoor Education Centre and 3 years working for the National Trust as an Education Officer. She particularly enjoys watching the children develop confidence, skills and a love of being outdoors during EKO sessions and when she gets a moment to herself she likes to garden, flower arrange and go walking. Emma was a Police Officer for West Midlands Police Force for 6 years but left in order to start a family. While she was a full time mom she returned to college to retrain as a Teaching Assistant and started work at a primary school in Solihull where she has been for the last 15 years. Emma is now a learning mentor, specialising in helping children to understand and manage their social and emotional difficulties and being the best that they can be. These skills fit perfectly within the Forest School ethos. Emma assists the running of a Forest school session in her school. Hannah has been teaching for a few years and in a couple of different countries. She loves being in nature and chose to do a Biology degree before her Post Graduate Teaching course to become a Primary school teacher. Hannah first had the chance to attend a forest school in Australia as part of ‘Bush School’ and has been excited about outdoor learning ever since. She loves camping, spending time out in forests and exploring beaches. She feels lucky enough to be involved in EKO and see the massive difference it makes to children when they get time outdoors to extend their learning and ignite their curiosity! 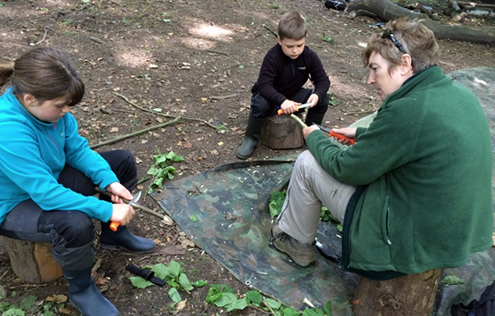 Jane has always enjoyed working outdoors and has set up her own Forest School business supporting schools and parents who home school their children in North Staffs. 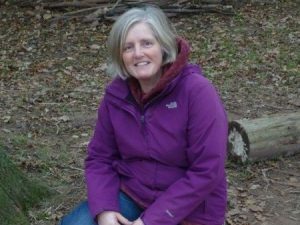 Her experience includes nearly 25 yrs teaching Geography and Humanities in secondary schools and she particularly enjoys doing voluntary ranger work in her local country parks, walking and playing badminton. Michelle has oodles of experience in Outdoor Learning and that, combined with her imagination, energy and sense of humour inspires and, enraptures children of all ages. Michelle qualified as a Forest School Leader, Level 3 in 2009 and works part time at a Nursery with a Level 3 nursery nurse qualification, running and developing their outdoor learning provision and is also GSL (Group Scout Leader) for her local area. 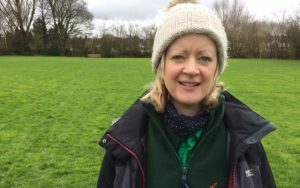 Lindsey has been involved in outdoor learning since 2011 when she started helping out as a volunteer at Forest School sessions at her children’s school. 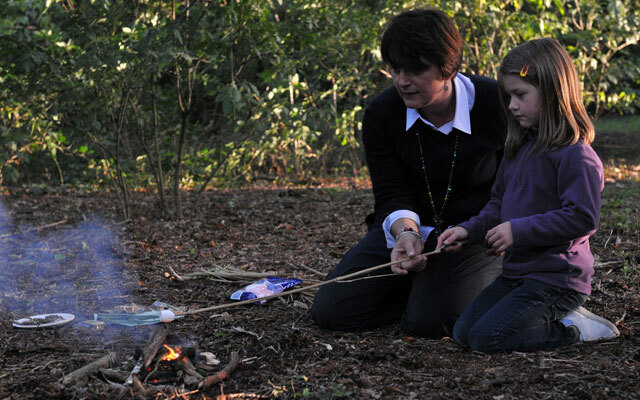 She began to see first hand the benefits of Forest School through her own children’s learning and behaviour and that of others and so embarked on her Forest School Level 3 training in 2013. Her qualifications include a BSc (Hons) in Environmental Biology, Level 3 Certificate in Forest School programme Leadership and a Level 3 Certificate in Supporting teaching and learning in Schools. 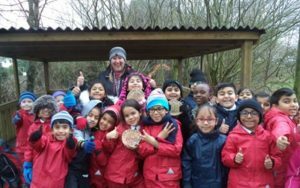 Lindsey believes that outdoor learning offers a positive experience for pupils because it teaches them to manage risks, overcome challenges and learn about the world around us. Her favourite part of delivering EKO sessions is seeing children grow with confidence as they master new skills! 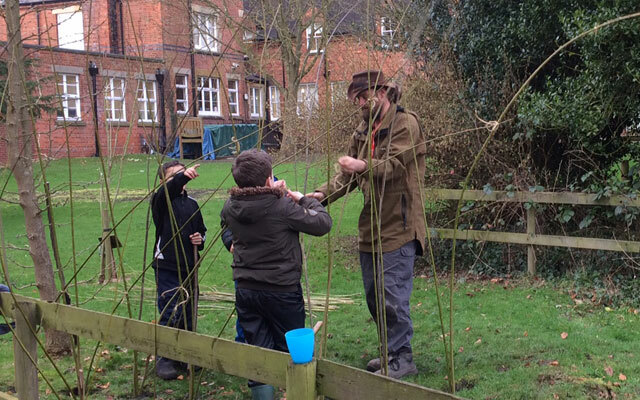 Andrew has been involved in outdoor learning for over 10 years. He started in countryside management and has worked in various settings including as primary school teacher. He works full time in the nature conservation sector and joins us occasionally to share his knowledge and enthusiasm for wildlife. Andrew’s qualifications include BSc Countryside and Environmental Management, MSc Entomology, and PGCE Primary. Andrew believes that outdoor learning offers a positive experience for pupils because they are connecting with the natural (real!) world. It stimulates all of their senses and allows them to explore away from the confines of the traditional classroom. Andrew’s favourite part of delivering EKO sessions is seeing the children have fun and growing in confidence while learning about the world around them. Dewi grew up roaming the Welsh countryside and is at his happiest and most creative in the great outdoors, especially woodlands. 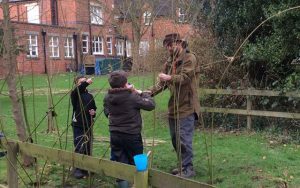 He enjoys working with willow and has helped EKO club children to design and construct wonderful willow ‘fedges’ and dens around their forest school sites. He turns his hand to any forestry job, enjoys learning and sharing green crafts and is looking forward to learning how to build cob ovens this Spring for outdoor cooking. Tonie started off teaching in classrooms in London, then had 4 children of her own. She recently re-entered the teaching world but this time outside the classroom as a Forest School Leader with a Level 3 qualification. She began working with school groups in her own woods and found she much preferred teaching them there! She particularly enjoys sharing this wonderful outdoor sight with the children. She loves her horses and dogs and being outdoors with her children. Abbie has worked with early years children for many years. 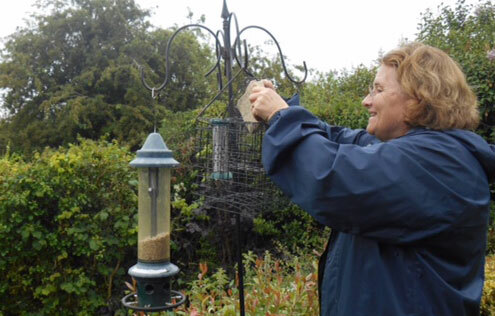 With a level 6 BA Honours degree and several years’ experience as a day nursery manager she wanted a change and was always very interested in outdoor learning. 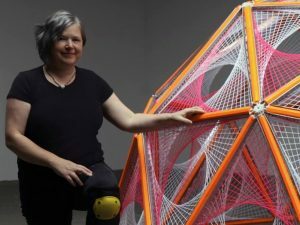 She believes that pupils gain many unique learning experiences outside that they can’t access inside. Having gained her Level 3 Forest School Leader qualification Abbie decided to pursue this interest further. During her EKO sessions she particularly enjoys teaching the children new skills that they haven’t come across before and has the patience to ensure they succeed. Christine has worked in environmental education for many years. For fifteen of those years, as part of forestry outreach programmes in East and West Africa, she was working with extra-curricular clubs in primary schools. For five years she was Forestry Extension Officer, in the Forestry Department of the UN. She has a BSc in Agricultural Economics and an MSc in Tropical Forestry. Since returning to UK she has taken her Level 3 Forest School leaders training, and has for two years volunteered as a support worker in primary schools and holiday clubs with the Wild Child activities for the Shropshire Wildlife Trust. She recently joined EKO as a Forest School Leader. Valuing the role of outdoor learning, she wishes to nurture the sense of awe and wonder that nursery and reception classes have of the woodland, through creating art, interpreting stories and encouraging exploring of natural habitats. 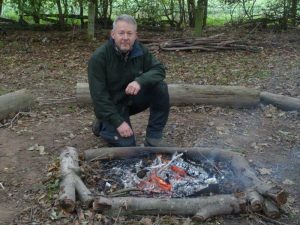 (Bushcraft) Alan has worked in the outdoors with young people since his children were young and his passion, interest and enthusiasm for Bushcraft is infectious. He has been trained by the best, worked with the best and whether he is with a group of older pupils or a Reception Class, he holds their attention and respect throughout the sessions. They may be rubbing sticks to make fire, building shelters out of natural resources, using knives to make bows and arrows or foraging for some delicious campfire cooking. Whatever activity they do with Alan creates a memory to treasure, a belief in themselves and the confidence to step out and try new things in new ways, whether as an individual or as a team.